The Gioia is clad in enamelled steel with a cast iron top and majolica insert. It has a steel firebox with a cast iron baffle plate, a grate and front grid as well as a removable ash drawer. Its door is made of cast iron, with a gasket that is in a metal sheath to resist high temperatures and ceramic glass that can cope with temperature up to 750 degrees Celcius. The Flue outlet, which can either be on top or at the rear, is 8 cm in diameter. The function control is multilingual with an option for remote control. It is programmable for daily, weekly, and weekend dual time settings. The controls can also enable you to save energy by using the automatic ignition and based on set ambient temperatures. 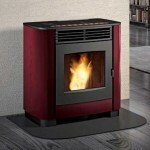 The automatic control of the fire gives it an eco function. Other options include remote control, humidifier, and a remote control system kit. 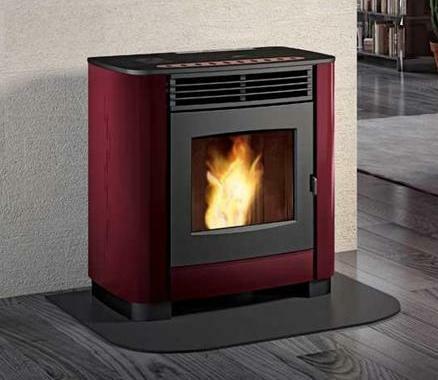 To find out more about stoves in this range contact us , or to get a provisional quotation please complete our quote form.